Dehydrating food has become all the rage. For those who want less waste and more food, dehydrating fruits and veggies can be a great way to preserve nutrients and make your groceries go a little bit further. We made it our mission to find the best food dehydrators on the market to give you the best and most efficient dehydrating systems. If you’re ready to start saving money, time, and food, it’s time to get dehydrating. Choosing the best food dehydrator can be a little tricky. There are several factors to consider before you jump the gun and buy one. Consider how much food you plan to dehydrate at a time and how much storage space you have for a new appliance prior to adding a dehydrator to your cart. Here are a handful of features to look into before buying your first food dehydrator. 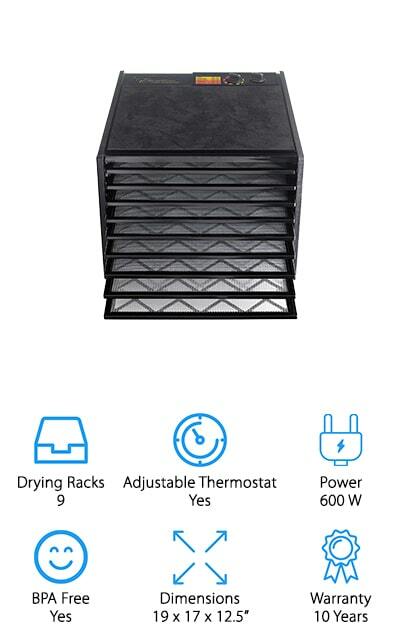 Drying Racks: If you plan to dehydrate a lot of food at one time, you will want to look for a dehydrator that offers you multiple drying racks to ensure you have plenty of space for all of your food items. Adjustable Thermostat: An adjustable thermostat is great if you plan on dehydrating several different types of foods. Instead over dehydrating or not dehydrating your foods enough, you can set the temperature exactly where you like it. Power: Different food dehydrators require different amounts of power. If you want a powerful food dehydrator, look for a system that offers higher wattage. Lower wattage is great if you want a cheap dehydrator and aren’t worried about time. BPA Free: BPA free shelves make sure your food won’t be exposed to plastic toxins as they dehydrate. If you’re worried about BPA, you’ll want to double check what parts of the dehydrator are free of it before buying. Dimensions: Finding space for appliances can be tricky if you’re an appliance aficionado. Knowing the dimensions of your dehydrator will help you find a place for your new appliance in your kitchen without piling things up on the counter. Warranty: Warranties are imperative to keeping your food dehydrator in good shape for years to come. Most dehydrators come with a warranty to cover any broken or missing pieces, but others will cover any faulty issues along the way if you have problems. For the best-rated dehydrator with the most space, you’ll want nothing less than the Excalibur 3926TB. 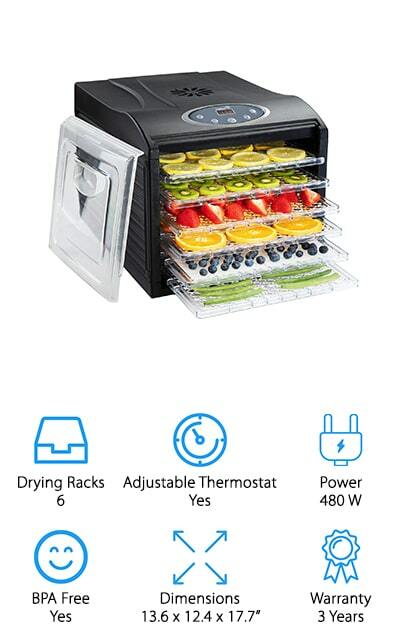 With 9 trays and 15 square feet of food drying space, you’ll be able to dry just about any foods you’ve had in mind. The adjustable thermostat allows you to turn the temperature up and down from 105 to 165 degrees Fahrenheit. This range of temperatures is high enough to dry out your food but low enough to preserve the active enzymes in your fruits and veggies. You can also dehydrate meat for jerky in this dehydrator as the temperature is high enough to meet those safety standards. With an adjustable 26 hour timer, you can dehydrate food until they are perfectly cooked and preserved. The best news is that the trays inside the dehydrator will never have to be turned or moved while dehydrating! 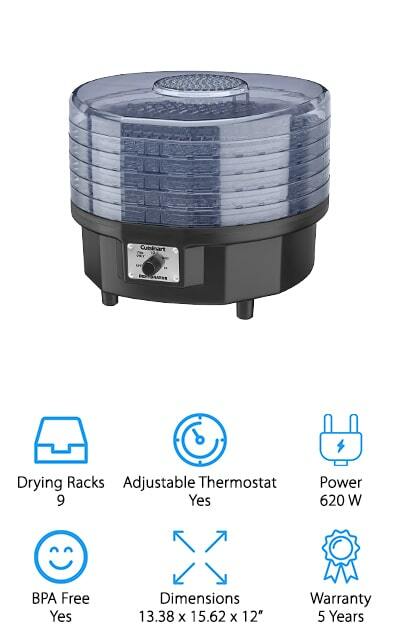 With all the benefits of dehydrating without the work, you’ll love the Excalibur 3926TB Food Dehydrator! For a few dehydrated snacks, the Nesco Snackmaster Pro Dehydrator comes in handy. This dehydrator comes with 5 trays, but you can buy additional trays up to 12 to add to this machine. The adjustable thermostat allows you to dehydrate food at temperatures of 95 to 160 degrees Fahrenheit. The powerful top mounted fan gives you 600 Watts of drying power to make it easier than ever to dehydrate food without all the twisting and turning of trays. The exterior part of the machine is made from opaque vita-save to block the harmful light rays that can destroy the nutritional values of your food. With Nesco’s patented Converga-Flow drying system, you’ll also never have to worry about flavor mixing between fruits and veggies on different trays. The machine also comes with two Clean-A-Screen flexible screens to make it easier to dry small items like herbs and spices. For the best cheap food dehydrator, look no further than the Nesco Snackmaster Pro Dehydrator. For those who are concerned with BPA free systems, the Chef Food Dehydrator is the first BPA free system on our list. Inside the machine, you’ll find 6 large BPA free plastic trays that make it very convenient for drying several types of fruits and vegetables. The digital touch settings allow you to change the thermostat from 95 to 158 degrees Fahrenheit. There’s also a countdown timer that allows you to dry foods for up to 19.5 hours. Chefman built this dehydrator to maximize the airflow to ensure that you never overheat your food. This machine has a transparent front door to allow you to watch your food as it dehydrates to monitor its progress throughout the day. With your Chefman purchase, you’ll receive step-by-step recipes and tutorial videos that make it even easier to use your dehydrator. Chefman’s Food Dehydrator has been known to be the best home dehydrator because it offers all the features you need to make tasty treats! 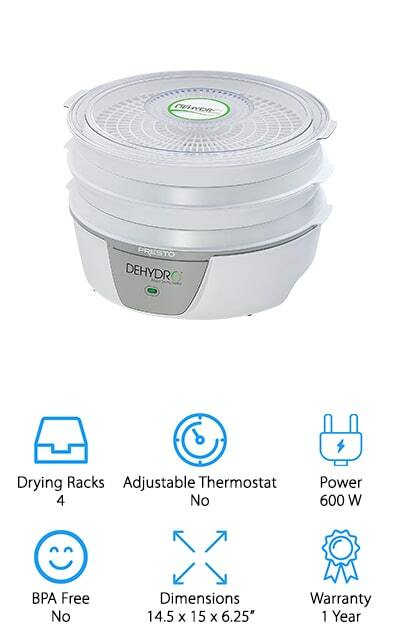 This four-tray food dehydrator comes at a fraction of the cost of other dehydrators on the market. The see-through cover allows you to monitor the progress of your drying foods, while the bottom mounted fan and heating element allows for consistent airflow. Both the trays and the cover for this machine are dishwasher safe. The trays are easy to store as they fit right into the machine when you’re done using and cleaning the dehydrator. When you buy this product, you’ll receive 4 drying trays, but you can also buy an additional 4 trays to meet its maximum capacity of 8 trays. 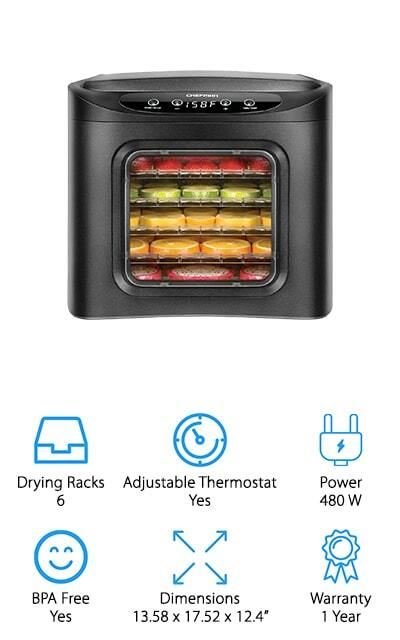 The Presto 06300 Dehydro Dehydrator does not have an adjustable thermostat, so you’ll only have the option to dry foods at 165 degrees Fahrenheit. If you want to dry several different kinds of foods like meat and fruits, you can purchase Presto’s additional kits to ensure you have everything you need to keep the maximum flavor and nutrition in every bite. MAGIC MILL’s Food Dehydrator is completely BPA free. This means you can enjoy all of your dehydrated snacks without worrying about toxins! 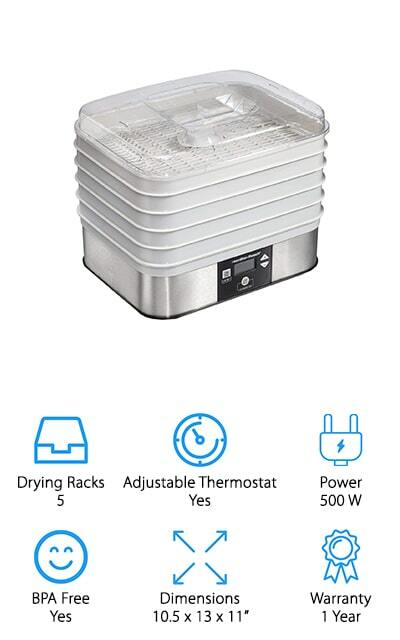 The machine itself comes with 6 stainless steel, adjustable drying trays, 2 plastic fine mesh trays, 2 non stick trays, and 1 set of oven mitts to get you dehydrating as soon as you open the box. With this wide variety of drying trays, you can dehydrate almost any food from meats to fruits to herbs. With that much room in this tiny little machine, you can dehydrate more than 6 pounds of food at a time! The digital thermostat is adjustable to allow you to dehydrate food from 95 degrees to 158 degrees Fahrenheit. You can also set the timer and walk away without worry as it the machine will turn off by itself when the clock hits zero. If you want to enjoy the benefits of preserved foods with great taste, the MAGIC MILL Food Dehydrator delivers exactly what you need every time. 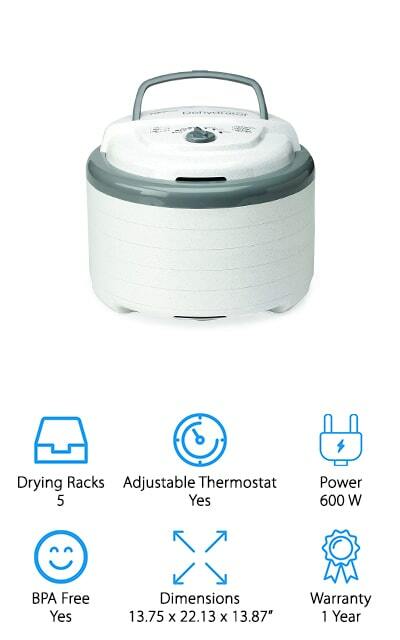 Cuisinarts DHR-20 Food Dehydrator is the perfect kitchen sidekick for families who always have leftovers and want to stop food waste. This machine dehydrates several types of foods including meats, herbs, fruits, and vegetables easily. Cuisinart prides themselves on being able to preserve your food naturally, so you’ll never have to add any preservatives or additives before you turn it on. With an adjustable thermostat, you can choose from 4 settings: fan only, low, medium, and high. This allows you to dehydrate each type of food perfectly without worrying about losing nutrition or taste. The powerful 620 Watt fan allows for fast, even drying so every food item will be crisp and ready when it’s time to remove them. You can stack 9 drying racks at a time, so you’ll always have plenty of room for any leftovers at the end of the day. For the best dehydrator at a great price, try the Cuisinart DHR-20 Food Dehydrator. Hamilton Beach’s Digital Dehydrator may seem simple but it allows you to do a lot more than meets the eye with your food. 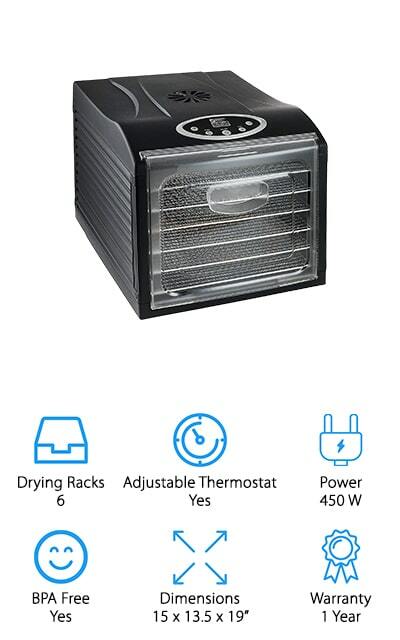 This compact dehydrator comes with 5 stackable drying trays and a powerful 500 Watt heating element and fan. In the 5 trays you receive, you’ll find one fine mesh sheet that’s perfect for drying small items like herbs and spices. You’ll also have a solid sheet that’s perfect for making fruit rolls, too. The digital thermostat is adjustable between the range of 100-160 degree Fahrenheit to ensure you dehydrate all of your foods safely. A 48 hour time allows you to dehydrate food while you’re away. The automatic shutoff comes in handy when you forget to come back and check on it after hours. This machine was designed to have continuous airflow throughout the drying trays to ensure every piece of food is ready when the timer strikes zero. For a great price and great quality, the Hamilton Beach Digital Dehydrator has everything you need to dehydrate food in a compact space. The Ivation Premium Dehydrator is another 6 tray food dehydrator that comes with several bonus features. The drying racks themselves are spacious and adjustable to small or big batches of fruits, veggies, or meats. The digital thermostat has 8 levels to choose from in the range of 95 to 158 degrees Fahrenheit to make dehydrating your snacks easy and safe, every time. Instead of a top or bottom mounted fan, you’ll find that this machine was designed with a rear-mounted fan to create optimal airflow across all drying racks. You can easily set the timer to turn off the dehydrator if you plan to be away when your food is done. You’ll no longer wonder if you overcooked or undercooked your dehydrated food! With a clear front door, you’ll be able to check in on your food without disturbing the drying process. Ivation’s BPA free food dehydrator is truly the best dehydrator for raw food with its customizable temperatures and features. 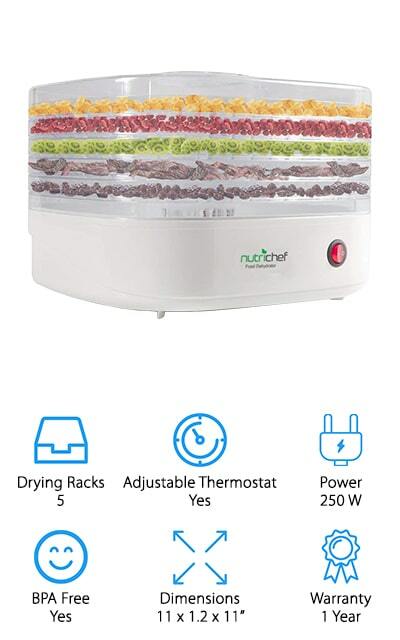 NutriChef’s Food Dehydrator offers everything you need to as a newbie to dehydrating foods. 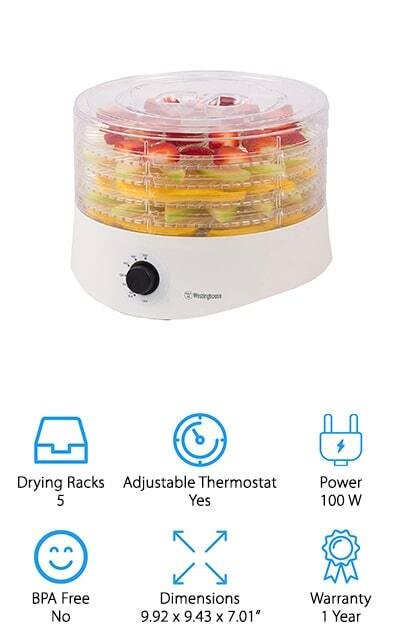 This electric dehydrator preserves several different types of foods including fruits, veggies, and meats. You can easily start dehydrating with the press of one button, but you can also adjust the temperature up to 180 degrees Fahrenheit, the highest of any other dehydrator on our list. The machine comes with 5 stackable trays that can be used inside or outside of the dehydrator to dry food. NutriChef had their circulation method scientifically tested to prove that their heating method prolongs a food’s shelf life compared to other dehydrators on the market. You’ll find that this machine may shrink the food you dry, but it will retain 97 percent of vitamins in minerals of the food itself after it’s done. With its compact size and shape, you can take this dehydrator with you anywhere including parties and camping trips. If you want an easy to use and efficient dehydrator, look no further than NutriChef! Last, but not least, is the Westinghouse Food Dehydrator. Known for fitting perfectly on any countertop, big or small, this dehydrator allows you to preserve food even with little to no space. Inside the machine, you’ll find 5 removable trays that allow you to dehydrate fruits, vegetables, and meats. On the outside, you’ll find a rotary dial that allows you to set the perfect temperature for whatever food you are dehydrating between the range of 104 to 158 degrees Fahrenheit. With your purchase, you also receive a dehydrating book that explores the many things you do when you dehydrate your food. The air flow system was engineered to make preserving your foods as easy as possible, so you’ll never have to rotate tray throughout the drying process. Although this machine may be small, it still packs a powerful punch when it comes to preserving food. For the best fruit dehydrator in a compact design, you won’t find anything better than Westinghouse.